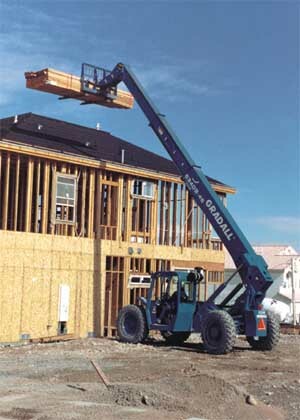 The Gradall CompanyD9-45 Gradall material handler is the first telescoping boom machine of its kind to offer the combined advantages of a 45-foot lift height, a maximum capacity up to 9,000 pounds and exceptionally easy operation. The 534D9-45 is perfectly suited for busy jobsites requiring precise placements of brick, block, mortar, lumber or other materials at heights of four stories. At full lift height, without outriggers, maximum capacity is still 6,000 pounds, while a maximum reach of 31 feet, 6 inches enables the 534D9-45 to quickly handle inventory placement in busy storage yards. The 534D9-45 is exceptionally maneuverable thanks to 90° rear pivot steering, pivoting on one front wheel while keeping the forks and load safely inside the turning radius. For excellent stability, the 534D9-45 has a mid-mounted engine, low center of gravity and long wheelbase. Automatic fork leveling and an 8° frame tilt further also help keep big loads on the level. The operator cab has certified FOPS and ROPS protection and an expansive view of the jobsite in every direction. One easy-to-use joystick controls the delicate movements of the strong, three-section boom and its collection of attachments. The no-shift hydrostatic drivetrain makes it easy to drive at any speed, including inching into precise positions. Tires: 13:00 x 24 - 12 PR, G2 type.